A SECOND LOOK, AFTER SOME CUTTING. 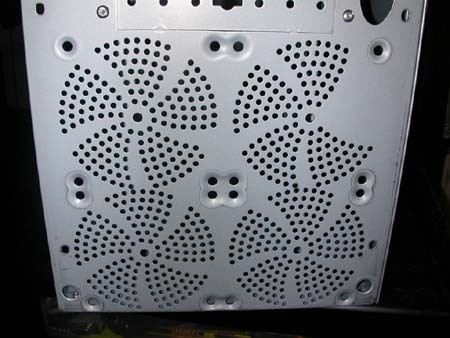 When I finished up my initial Raidmax Scorpio 868W case review a few days ago, I mentioned that airflow could be improved by removing the stamped in “cheese grater” fan openings that are used in this case’s design. I cut out these openings, as mentioned, and these are my results. I started out by stripping the chassis bare to get ready for the cutting work. Removing everything ensures no debris from cutting will wind up lodged somewhere where it will cause a short and fry anything. 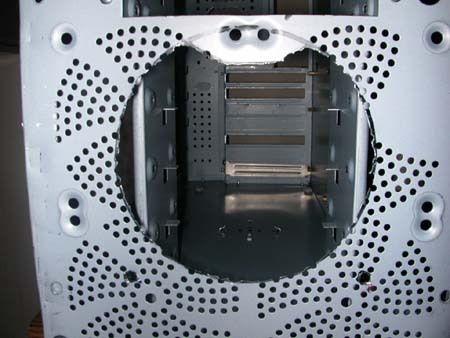 Once the chassis was bare, I used the tools from my Heatsinks and Window Mod articles (air powered automotive tools) to cut out the holes for the fans. 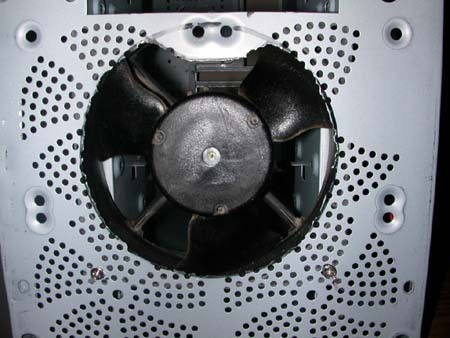 single high CFM 120mm fan instead, centered directly in front of the opening in the front bezel. prepared to do some dusting as time goes by. Let’s look at the rear (exhaust) side next…. of internal air movement. The overall airflow pattern has changed quite dramatically however, as well see in a moment. Next page: Conclusions and final thoughts…..
Swiftech MCX4000 HSF, with 80mm Sunon 39CFM fan attached. No modifications to the board have been done, the Northbridge HSF is the original Abit part. I noticed that the side panel fan is blowing out, and left it alone for now. I will reverse it to blow in and see how that effects temperatures (if at all) next. The other two (exhaust) case fans are as they came with the case. I’ve got the “Lil’ P4 That Could” running at 147 FSB @ 1.65v, and have gotten it to 150 FSB with a bit more voltage. I didn’t like the temps running it that high, so I backed off a touch to 147/1.65v. really get the full potential out of a P4 system (I haven’t run intel since my P///700E, over two years ago) might get this number even higher. Like an idiot, I forgot to take a screenshot of my “before” temps. I recall precisely what they were, but it might have been nice to have a pic to post of them. When the ambient temperature was the same (22C), the numbers were CPU: 42C, System: 23C. I mentioned in the original review that I thought the side panel fan was “weak”. Reversing the air flow direction of it to blow into the case didn’t change the temps at all, up or down. were part of this case directly impacted temps here by 6 to 7C. I’ve yet to try, but I wouldn’t be a bit surprised if 148 or 149 FSB might be stable at 1.65v, now that the temps have been reduced. Once again, I’d like to thank the good folks at Directron for sending this case out for us to review.